The Heaven itself, is blinded throughout night. Or word, or look, or action of despair. When we stand amid the columns of broken temples, gaze upon riddling hieroglyphics or trace the spiral patterns on cavern walls, we glimpse the gods of ancient times. Who or what were they? Did they really walk upon the earth? And could their weird and twisted forms possibly return to haunt our imagination? In this extract from his poem “Hyperion,” Keats describes the Titans, the gods who ruled before the Olympians. Their power is waning. Try as they might, they cannot rouse themselves from lethargy and confusion. Soon, the charismatic Jupiter will wrest the throne from Saturn, the King of the Titans, and the names of Coeus, Gyges, Dolor, and Porphyrion will be banished forever—except perhaps to live on in poetry. Every epoch must end, every vision of perfection replaced by another. (The Olympians will, of course, be themselves deposed by the God of the Christian era.) Take the idea of the zeitgeist. Changes in culture dictate what people believe and what they don’t believe, but where such changes spring from is remarkably tricky to pin down. They just happen to be blowing in the wind. In a brilliant phrase, Keats compares the old gods to a “dismal cirque/ Of Druid stones,” linking the image of a stone circle with a dreary circus out of a nightmare, maybe because it goes nowhere, endlessly. 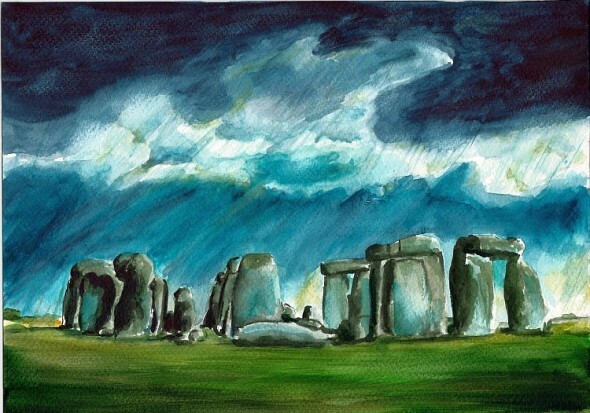 He evokes Stonehenge, whose massive blocks of granite have stood on Salisbury plain for more than 3,500 years. Was it a temple? An astronomical clock? A place for storing grain? Despite all the theories, no one has ever worked out its purpose. Even the Druids are a mystery, their way of life obliterated by the invading Romans. 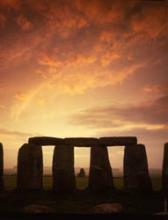 Stonehenge is only one of hundreds of stone circles that dot the British countryside. West Cornwall, in particular, is full of sites such as the Merry Maidens, the Nine Maidens, the Hurlers and the Pipers. As the names suggest, there is a persistent myth that these stones were once human, whether women punished for dancing on a Sunday, or men for playing games—and it’s easy to imagine that it’s true, seeing their silent forms at dawn or dusk, on the borderline of reason and wonder. Keats shows us the stones with the “chill rain” pattering down “at shut of eve,” as night takes hold and the light is extinguished. This is our world too, as we read the poem at the end of “dull November” and we prepare for the rigors of winter. The heavenly blue sky has turned into a “chancel vault,” enclosing the gods—and us—in a slate gray tomb. We all await our rebirth in the spring. So what happens to the Titans in the poem? Do they die or do they return? It seems oddly fitting that we never discover. Keats abandoned his work halfway through, frustrated he couldn’t find a voice that was independent of Milton, author of the epic “Paradise Lost.” Keats’ decision was an act of rebellion, mirroring Jupiter’s insurrection against Saturn. Today, “Hyperion” resembles the Druid circle it describes: a magnificent, melancholy ruin, full of secrets for every reader who wanders in. Christopher Nield is a poet living in London.